An intense competition that included a public vote has ended with an aurora-and-mountain theme for Alaska's official "Artistic License Plate." And a 21-year-old from Palmer designed it. The Alaska State Council on the Arts on Thursday revealed both the winning design and the artist behind it, Anita Laulainen. Judging was done with artists' names shielded to avoid any bias, said Andrea Noble-Pelant, arts council executive director. Laulainen, who grew up in Palmer, is a senior in graphic design at the University of Alaska Anchorage. She took on the project as a class assignment. "We could decide whether or not we wanted to submit it," Laulainen said. "I thought: might as well." She said she wanted to show the beauty and the romanticism of Alaska. She thought first of northern lights, then snowy mountains – harsh, forbidding, beautiful. "I brainstormed how to incorporate the two together," she said. "Mostly it was just tweaking colors." Some 142 Alaskans from around the state submitted designs earlier this year. A "celebrity jury" that included, among others, Alaska first lady Donna Walker, Iditarod musher Aliy Zirkle, artist Ray Troll, state Sen. Mia Costello and Rep. Jonathan Kreiss-Tomkins reviewed them all based on the quality of the design, readability for law enforcement and "imagery that celebrates aspects of our unique Alaskan identity," according to the arts council. The jury winnowed the submissions to five — a raven, swimming salmon, a cache and fireweed, plus the aurora theme — for online voting. More than 17,000 Alaskans weighed in. Kreiss-Tomkins was the House sponsor of a bill that set in motion the art plate competition. "Nothing about Alaska is ordinary. If we have to print tiny rectangles of metal to hang on our cars, why shouldn't we make them as awesome as humanly possible?" his office said on the competition website. Laulainen gets recognition, plus $1,000 for a design fee. 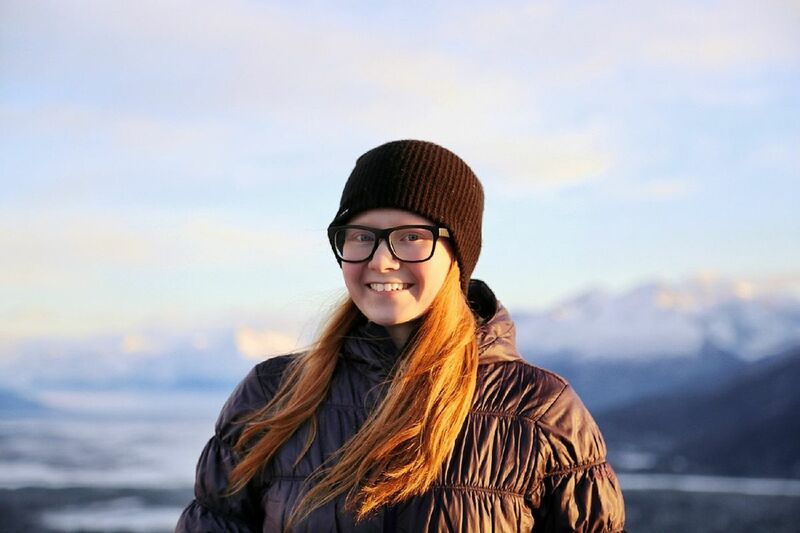 She hopes to work in graphic design in Palmer or Anchorage after she graduates in the spring. She said she spends her free time hiking, kayaking, running and just enjoying the Alaska outdoors. "You can get high up in the mountains and you can be in the complete silence," Laulainen said. She said she couldn't believe it when she won. "It'll be crazy to finally see it on people's cars," she said.